MB-GPS2KML works on Win95 / Win98 / WinMe / WinNT / Win 2000 and WinXP. A little nag application - inspired by a very old application "shoot.exe". 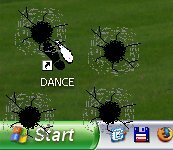 If the mouse stops moving on a position for more than 2 seconds, there will be a bullet hole on this position of the screen, but you can continue working with the elements below. This is realised with the help of the MB-ScreenTransparent SDK. This application adds black pixels on the screen, that look like pixel errors of a TFT display. A chrismas card, that creates a winter scenary on your screen. The Winter-Wonderland Card has it's own homepage.